Switzerland - IOM on Friday (06/01) reported preliminary totals for all 2016 migrant and refugee arrivals to Europe via the Mediterranean Sea, as well as estimated fatalities. 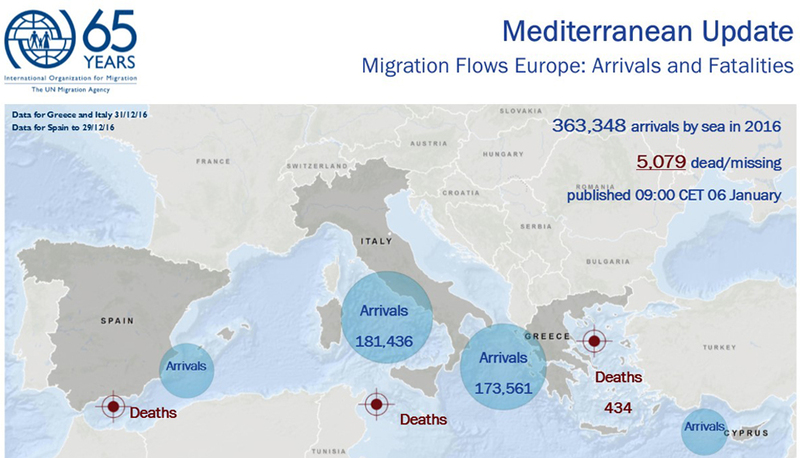 Arrival totals were 363,348 split almost evenly between Italy and Greece, with much smaller numbers arriving in Malta, Cyprus and Spain. Fatalities and missing migrants reached at least 5,079 although IOM emphasizes that some incidents reported in the month of December and earlier have not been fully accounted for. According to IOM’s Missing Migrants Project, incidents off Spain, Morocco and Tunisia have been reported whose victim totals could add another 300 or more fatalities to the 2016 total. The year 2016 already is the deadliest for migrants ever recorded by IOM in the region. The probable addition of several hundred more fatalities recorded in 2016 only deepens the tragedy, said IOM Director General William Lacy Swing, who added, Europe’s frustration with a seemingly endless cycle of migrant rescue followed by reports of shipwrecks and more drownings won’t end until governments throughout the region find a way to manage migration comprehensively. IOM believes many more deaths at sea may have gone unreported last year – in the Mediterranean and elsewhere – particularly between North Africa and Spain, where data collection often has been sporadic and many smaller vessels are believed to have been lost without detection. IOM’s Missing Migrants Project reported there have been 11 new fatalities since the start of 2017, three in the waters between Spain and Morocco and eight in the Central Mediterranean between Italy and Libya. Of those eight cases, IOM Libya on Wednesday reported the recovery of five bodies near Tripoli. Last week IOM reported 11 bodies washed ashore in Libya. Maysa Khalil of IOM Libya reported that Wednesday’s tragedy unfolded close to IOM’s Tripoli office. IOM reported 65 surviving migrants – 60 men and 5 women, one of them a pregnant woman from Senegal. Khalil said the rescued migrants were transferred to Al-Falah centre in Tripoli, where IOM staff visited immediately after their arrival to provide kits of Non Food Items, Hygiene Kits and clothing. The expectant mother was transferred to a hospital where she was reported in good health. IOM Rome spokesperson Flavio Di Giacomo reported Thursday 181,436 migrants arrived in Italy by sea last year, a nearly 18 percent increase compared to 2015 and a smaller, 6 percent increase over 2014 totals. In 2014 the largest portion of seaborne migrants leaving Libya for Europe came from Syria, a population that shifted its route to Greece, via Turkey, in 2015. This past year Syrians arriving via North Africa numbered fewer than 1,000 – compared to 42,323 in 2014 and 7,448 in 2015. During 2015 and 2016 approximately 550,000 Syrians entered Europe after traveling by sea from Turkey to Greece. Arrivals to Greece in 2016 totalled 173,561 in 2016 – or 20 percent of 2015’s total of 853, 650. IOM Athens reported on Thursday a total of 371 migrants arrived at five separate islands this past week – about one third, 121 migrants, landed at Lesvos, with smaller numbers arriving at Chios (43), Samos (44), Rhodes (13) and Kalymnos (16). Last year during the first four days of January, a total of 7,806 migrants arrived, or nearly 2,000 per day.